The Hubba Wave, newly introduced for 2019 from Buzz Wireless, is a data and Wi-Fi router device that provides boat owners with a range of benefits for a simple monthly charge. The Hubba Wave facilitates fast 4G connectivity for coastal cruising up to 15 miles offshore at a fraction of the cost of VSAT. The device is ideal for inland waterway use as well. The Hubba Wave can be accessed by laptop, tablet or smartphone and is loaded with 40 GB of data per month and unlimited phone minutes. The Hubba Wave is supplied on a 24-month contract for a one-off cost of £39.95 plus VAT and a monthly charge of £39.95 plus VAT. Boat owners who have membership of Netflix, Apple Music, TV Player and other popular Apps will also benefit from watching movies and TV without using any of the 40GB monthly data allowance. 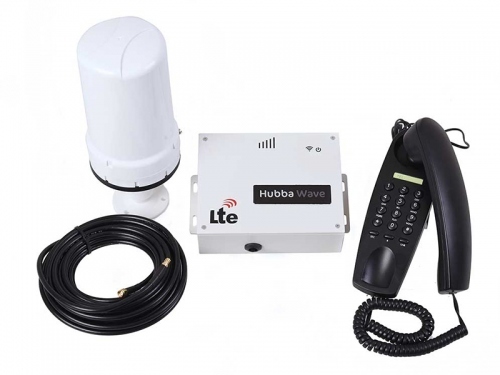 The Hubba Wave will accept all wi-fi connected devices on-board and has the additional benefit of a plug-in telephone handset, that can be used as a fixed boat ‘phone with unlimited minutes*. This phone usually has better connectivity than a mobile phone due to the antenna on the Hubba Wave, so can be used further offshore. The cost covers the router box, aerial, all cables, the handset and 40GB of data per month*. Boaters crossing the channel to EU countries will be able to roam without penalty**, as is now standard with mobile providers. Buzz Wireless has been at the fore front of developing mobile connectivity for leisure boats, commercial vessels and shipping for many years. Its Hubba range of routers has successfully provided powerful connection for coastal use, reducing the cost of connectivity from small yachts to passenger ferries. The new Hubba Wave for leisure users encompasses all this development work within a simple monthly contract designed to keep you connected while cruising.